On the remote island of Svalbard, Norway, is the most genetically-diverse spot on planet Earth. The island itself isn’t the most pleasant place; in fact, it’s a miserable, frozen rock above the Arctic Circle where the only wandering life is polar bears. However, dug into the side of Platåberget Mountain is the Doomsday Vault. 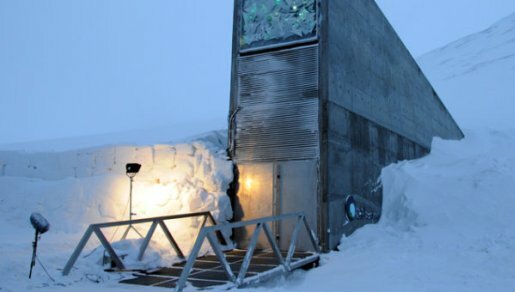 Better known as the Global Seed Vault, the refrigerated vault is home to the world’s largest supply of seeds. A combined venture of the Nordic Genetic Resource Center and the Global Crop Diversity Trust, the seed vault is home to literally every sort of seed cultivated by man. There are over half a million seeds in the vault, from pink tomatoes brought to Iowa by a Bavarian farmer to dwarf wheat, disease-resistant soybeans, and beyond. Scientists believe that the seed vault, with its various types of food plant, might be the key to humanity’s survival one day. Heat, cold, drought, or poison, there’s a type of seed there that might one day be the key to crops that survive whatever conditions you throw at them.